Monster Boy And The Cursed Kingdom is finally here after years of development during which the art style has changed quite dramatically. We can now share a couple of videos recorded on Xbox One X, as well as our short verdict. 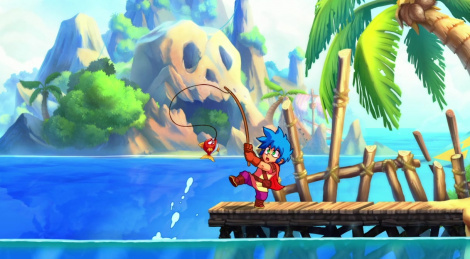 With its colorful graphics, its perfectly designed characters and its great soundtrack, Monster Boy And The Cursed Kingdom is a true love letter to Ryuichi Nishizawa and his work. Gameplay has not been left behind, with the perfect mix between what made the series so popular and a more modern approach that makes the game even more enjoyable to play. It is still challenging enough though, but never to the point where newcomers will give up because they are completely frustrated. All you have to decide is the system on which you'll play the game really. If you didn't know how to keep yourself busy until Christmas, well here's your best option! Thanks for the review and the videos. Definitely gonna check it out, sounds and looks like a really lovely game. PS. You don't have it in the platform list, but Monster Boy And The Cursed Kingdom will also launch on Nintendo Switch. Something important for some people, since they might prefer it on the Switch. This looks fantastic, But oh my days that music is enough to switch it off. Steam/PC release is too damn far away.